Each course of Targeted Training is unique. By working together with each child and their family, we aim to make the best progress possible. To date, Targeted Training has helped more than 500 children gain functional skills, which can truly transform a child’s life. 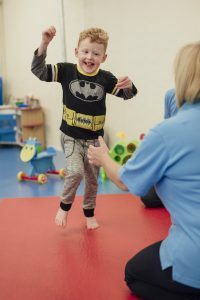 As a result of a course of therapy we see children turn their head for the first time to interact with their family and friends, sit unaided so that they can play or even take their first independent steps. This can all lead to lots of mischief and fun! Targeted Training works best in addition to traditional physiotherapy. It can make a big difference to a child’s development. It was pioneered at The Movement Centre, over 20 years ago, and has been delivering positive outcomes since.